This article is not written by me. This article is originally written on theguardian.com and there is a link to the original article here. Results from across the country suggesting the Brexit camp were on the brink of declaring a referendum victory saw sterling down 10% against the dollar. The value of sterling slumped to a 31-year low on currency markets and was on course for its biggest one-day loss in history as panicking investors contemplated the prospect of a vote to leave the European Union. Results from across the country suggesting the Brexit camp was on the brink of declaring a referendum victory led to sterling reversing initial gains to leave the pound down more than 10% at $1.33, compared with $1.50 just after polling stations closed. That was the lowest since 1985. The pound was down more than 7% against the euro. With markets braced for turmoil over the coming days, safer assets such as gold were in high demand. The precious metal, a long-time favourite investment in uncertain times, soared as much as 7% at one point. The pound’s fall, which stunned investors, was its biggest ever one-day fall, and ranked with the reaction to the collapse of Lehman Brothers in 2008 and Britain’s exit in 1992 from the European exchange rate mechanism on Black Wednesday. Traders were expecting the FTSE 100 share index to mirror the pound’s sharp losses with potentially more than £100bn wiped off shares. The market does not open till 8am, but spread betting firm IG is calling the FTSE 100 down by more than 450 points and Wall Street off by more than 600 points. Spread-betting and trading firm CMC Markets UK was calling the FTSE 100 down 468 points from its overnight close of 6,338 at 5,870. Its chief market analyst, Michael Hewson, said the consequences of the vote looked set to “ripple across the EU and the world”. “Banking stocks are likely to be a particular concern given the weakness of the banking sector in Europe and the linkages between the UK and Europe,” he added. The Tokyo stock exchange joined the rout overnight after opening up slightly from its previous day. Traders in Japan knocked 7% off the value of shares in Tokyo, the biggest one-day fall since the Fukushima disaster in March 2011. In Hong Kong, shares in Britain’s biggest bank, HSBC, fell more than 5%. Earlier momentum for sterling, attributed to investors seizing on a YouGov poll that indicated a narrow victory for remain, was halted as soon as results came in. Market watchers said the mood changed after a string of results from the north-east, Midlands and Wales pointed to a close result and possible Brexit win. 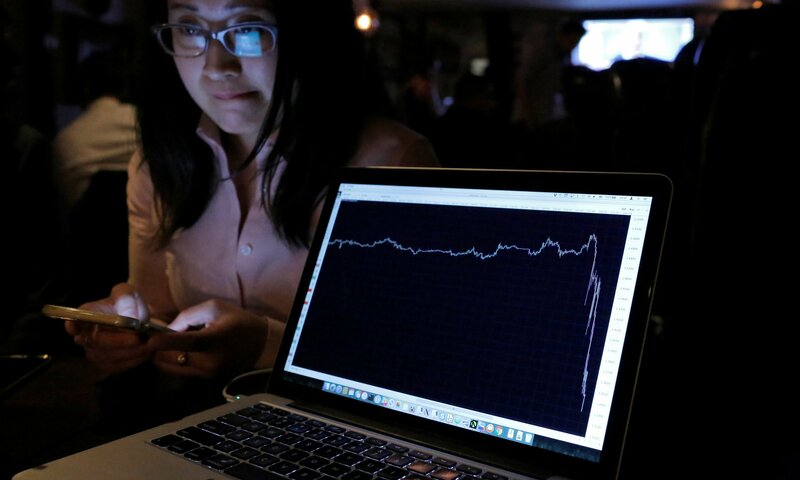 Jeremy Cook, chief economist at currency broker WorldFirst, watched sterling plummet throughout the early hours of Friday. He said: “Sterling is in freefall at the moment. It looks like its goose is cooked.” At one point, Cook shouted across the trading room: “It’s fallen into the 30s,”, as the likelihood of a leave vote increased and the pound fell below $1.40. Sitting in the dealing room of the currency firm, Cook watched sterling slide after the Newcastle and Sunderland votes came in. He warned there could be a fall of “biblical” proportions if the vote is for Brexit. As more results came in, Cook said the pound was suffering swings in volatility that exceeded the financial crisis. Shortly after polling stations closed, Cook had warned of severe consequences if the result confounded recent polling. “On the other hand, the collapse of a leave win, something the market has almost fully discounted, could be truly biblical.” The later shifts in the pound early on Friday morning appeared to confirm those fears. The FTSE and pound have been buffeted by close opinion polls during the campaign but in the past week market sentiment has swung to show growing confidence in a vote to remain in the EU. The FTSE has rallied every day this week and by Thursday’s close was up 5.3% for the week so far. Why not just post the link and write your comments? Isn't posting the entire article, even with reference, copyright infringement? this site is anti-copyright. People should be free to transfer information to spread that information. I pointed out that I didn't write this article as a courtesy.